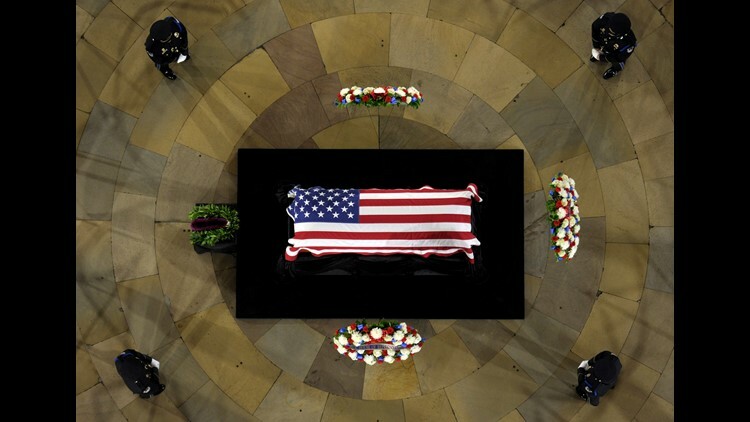 Sen. Daniel Inouye, D-Hawaii, the second-longest-serving senator in history, lies in state in the Capitol Rotunda in Washington on Dec. 20, 2012. WASHINGTON – Sen. John McCain will lie in state at the U.S. Capitol on Friday, a rare honor bestowed on only 31 people in 166 years. Senate Majority Leader Mitch McConnell announced the decision of congressional leaders from both parties Sunday, calling McCain "a great American patriot, a statesman who put his country first and enriched this institution through many years of service."